As we all know, this season has marked the first time that the boys from the Basque Country have had riders on the roster than weren’t Basque or hadn’t come up through the Fundación Euskadi youth system. Here’s a look at how these imports have done so far this season. First, a piece I wrote last October talking about the non-Basques that the team were planning to sign for the first time ever. Of course, in the past the squad has included Unai Etxebarria (Venezuelan but with Basque heritage), Romain Sicard (from Bayonne, part of Labourd in the French Basque Country) and most notably Samuel Sánchez, an Asturian who came through the Fundación Euskadi youth teams. 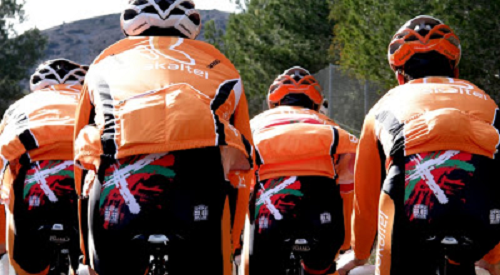 However, this season we have seen riders from Greece, Germany, Morocco and more ride in the famous orange kit. We have all read about the monetary problems that the team has been having in recent seasons, as has much of Spanish cycling – from a high of 14 teams at all levels in 2006, the total is just 5 this season. 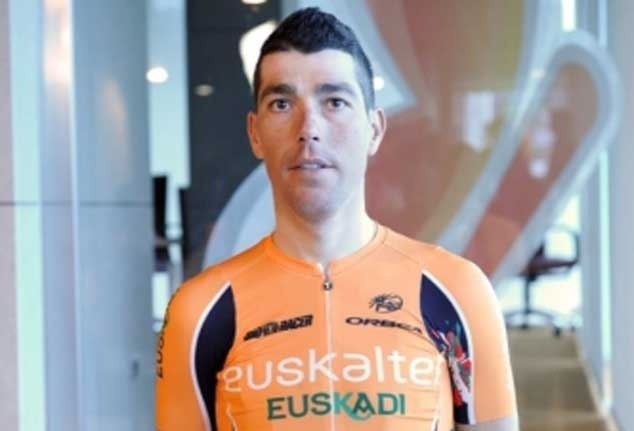 There has been repeated talk in the past few years that Euskaltel-Euskadi could drop down to cycling’s second division, and become a Professional Continental. Dropping down a level would mean that they could keep a smaller squad as they wouldn’t have to race to a set calendar, and that they could avoid races which aren’t suited to the riders (Paris-Roubaix, Eneco Tour…) or mean nothing to the sponsors (Beijing, American races..). The unnecessary travel costs would also be avoided. The worry about obtaining points in order to stay in the WorldTour would also go away. 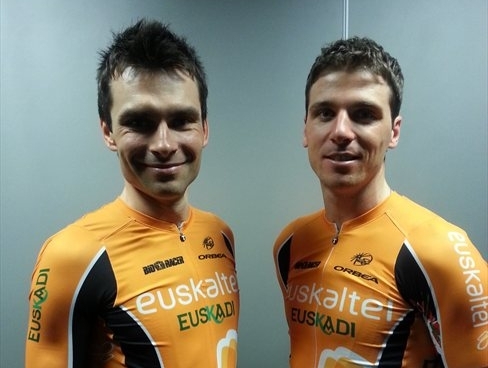 It is this worry that has led Euskaltel-Euskadi to boost their own tally and bring in foreigners in 2013. Here’s a list of those riders – Tarik Chaoufi (Morocco), Jure Kocjan and Robert Vrecer (Slovakia), Ricardo Mestre (Portugal), Juan Jose Lobato (Spain), Steffen Radochla and André Schulze (Germany), Alexander Serebryakov (Russia), and Ioannis Tamouridis (Greece). 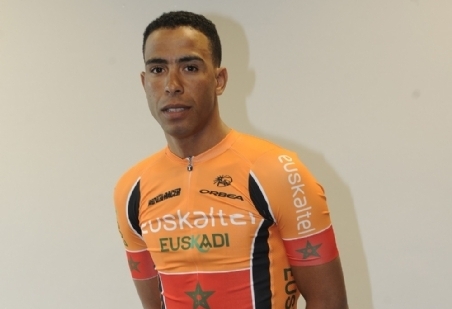 Moroccan champion Chaoufi was probably the least well-known of the new additions but won the UCI Africa Tour last season. He was consistent throughout the season, gathering numerous top ten finishes at the Moroccan races such as the Tour du Maroc, Challenges Marche Verte, Challenge du Prince and Challenges Phosphatiers, grabbing three wins, as well as a stage at the Tropicale Amissa Bongo – a race notable in Europe for the participation of French team Europcar. 2013, however, has proven to be a lot less fruitful for the 27 year-old Chaofi. As anyone would’ve expected from a rider signed solely for the reason of bringing UCI points, he has been anonymous for Euskaltel this year. He finished the Clasica de Almeria and the Handzame Classic before riding the Volta a Catalunya for three stages before abandoning. A month off came, before he returned with a 71st place at the Vuelta a la Comunidad de Madrid and a DNF on Stage 1 of the Vuelta a Asturias. Chaofi hasn’t raced since his 7th place finish at the Moroccan Championships in late June. Vrecer, 32, and Kocjan, 29, both brought a nice bunch of points on board with them. Riding for Austrian team Vorarlberg last season, Vrecer had beaten Davide Rebellin in the Tour of Hellas last season, before picking up the Slovenian TT Championship title and putting in a strong 3rd overall at the tough Tour of Austria. In 2011 he got a number of wins in Croatia, Slovenia and Poland. Kocjan’s better results came in 2011, as part of Team Type 1. He didn’t get any wins, but was consistent throughout the season, getting top 5 and top 10 placings in stages at the Tour du Haut Var, Strade Bianche, Tour of California and the Tour du Limousin. Last year he rode in several WorldTour races – Milano-Sanremo, La Flèche Wallonne, and the Tour de Pologne. Vrecer has been more successful than Kocjan this season. He participated in Tirreno-Adriatico and Milano-Sanremo (abandoning both) before riding and completing his first Grand Tour, the cold and arduous Giro d’Italia. Last month, he won the mountains jersey at the Tour de Suisse, perhaps the greatest achievement so far of the new boys. 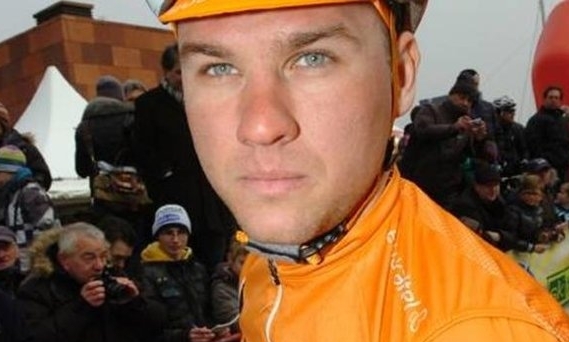 Kocjan dropped out of Paris-Nice on Stage 1, before taking April out due to a viral infection. It looks like he hasn’t fully recovered yet, as he hasn’t raced since DNFing the Bayern-Rundfahrt in May. Portuguese rider Mestre won both the Volta a Portugal and Trofeu Joaquim Agostinho for Tavira-Prio in 2011, and looked like he might be a decent signing from a sporting perspective as well as bringing points. The 29 year-old had ridden in the Portuguese scene at Continental level all his career upto this season, and it looked as though his climbing ability would come in handy for Euskaltel. He has done better than a few of the other new signings so far, completing three major stage races in the Volta a Catalunya, Giro d’Italia and Tour de Suisse. He hasn’t had any big results yet – as one might expect the jump from Continental level to the WorldTour is a tough one – but he did help Sánchez to twelth place at the Giro. Maybe we will see more from him in the latter stages of 2013. 24 year-old Lobato is a Spaniard, but not Basque, and he didn’t come through the youth ranks so he does count as a foreign signing. Coming from the now-defunct Andalucía team, he has participated in the Vuelta twice, and in 2011 took his biggest win to date at the Circuito de Getxo. Last year he finished the Vuelta for the first time, and won stages at the Vuelta de Chile as well as the Tour of Quinghai Lake. This season, as you can see, he has won a race! To start off with, Lobato rode the Tour Down Under before picking up top tens at the Clasica de Almeria and Vuelta a La Rioja. In mid-April he beat J.J.Rojas among others to win Stage 2 of Vuelta a Castilla y Leon. A month later he twice came close to doubling his tally at the Bayern Rundfahrt, getting two podiums. He has just completed the Tour de France, in which he sprinted to a top ten place three times. The German duo promised to be useful when they joined this year, but very little has been delivered. 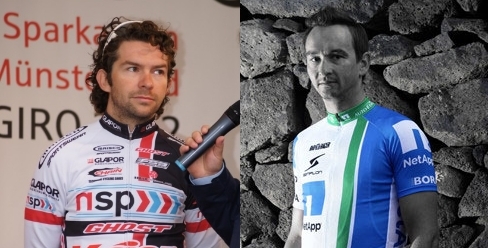 38 year-old veteran sprinter Schulze came from Team Netapp and has had better results in recent years – last season he was second to Andy Fenn in Trofeo Palma de Mallorca and rode Paris-Roubaix and De Ronde. Stage wins at the obscure Polish race Course de Solidarnosc et des Champions Olympiques followed, before he grabbed top tens at Memorial Rik Van Steenbergen and Paris-Bruxelles at the end of the season. Radochla has ridden for well-known teams such as Festina, Coast/Bianchi, and Illes Balears-Banesto in the past, and has also won the Memorial Rik Van Steenbergen as well as the Dutch Food Valley Classic. In recent years the 34 year-old has ridden for German teams at Continental level and obtained some minor results. Radochla was seemingly brought as part of some deal with Schulze, seeing as his points value was close to zero. This year, both riders have amassed zero points, with DNFs and minor placings galore. It says a lot when their combined best result is Radochla’s 14th place on a stage of the Volta ao Algarve. Of the five races Schulze has competed in so far, he has only finished one – 110th place in the ProRace Berlin. Neither has raced in over a month, though they recently resurfaced in a post-Tour criterium. A part of Team Type 1 in his debut professional season last year, the 25 year-old Russian sprinter got a slew of good results (and points). He was fifth at Kuurne-Brussels-Kuurne, and won the Philadelphia International Classic. He also enjoyed his time in Asia, winning stages at the Tour de Korea and the Tours of China, Hainan and Taihu Lake. However, his time at Euskaltel has been nothing short of a disaster. He rode in Belgium in the Spring, racking up DNFs at E3 Prijs, Gent-Wevelgem and De Ronde. 14th place at the GP Pino Cerami was his best result. It was a few days later when the news came through that he had tested positive for EPO in an out-of-competition test on March 18th. Later on we heard that a sample from February 21st 2012 was re-tested and also came up positive. His likely punishment will be a two year ban. Finally, the sole Greek addition to the team (I have no idea how some of these guys have been communicating with each other but whatever). The 32 year-old spent four years at Greek Continental team SP Tableware before making the step-up to the big-time this year. Six-time Greek time trial Champion, and with three wins at the road race also under his belt, he definitely looked to be one of the best riders in Greece. In earlier years, Tamouridis was a track star, winning medals in World Championships in 2005 and 2006. He only turned professional on the road in 2009, and immediately took bronze at the Mediterranean Games, behind now-WorldTour pros Tony Gallopin and Adriano Malori. That year he also led the Romanian Tour, a race in which he has won multiple stages over the years, including three last year. Tamouridis has podiumed there twice too. In 2011, he led his native Tour of Hellas before ending up 2nd overall, a result he would repeat at the Latvian Jurmala GP, the Romanian Tour, and the Tour of Szekerland. At the end of the year he also rode the World Championships road race and time trial for the first time. Last season he was consistent throughout, getting top tens at stage races in Algeria, Greece, Russia, Romania and Portugal. A proud moment came in the Summer, when he competed at the Olympics, finishing alongside Tour de France contender (now winner) Chris Froome. Later in the year he improved two place to finish 28th in the World Championships time trial. 2013 has been a success for Tamouridis, with him blending seamlessly into the WorldTour peloton. He finished Tirreno-Adriatico before soldiering on to complete Milano-Sanremo in awful conditions. The northern classics beckoned, and after a few DNFs, the first Greek WorldTour rider became the first Greek ever to finish Paris-Roubaix, coming in with a creditable 60th place. Soon after he was breaking records again, becoming the first Greek to ride, and later complete, the Giro. In this years wintery edition, he proved his toughness and also showed that he can sprint, beating the likes of Bennati, Hunter, Ventoso to grab a top ten finish in Treviso. The likeable rider again dominated the Greek National Championships last month (that’s 11 in total on the road now), winning each race by over a minute and a half. He dedicated his TT win to team masseur Rufino Murguía, who passed away that after an accident involving the team bus. A mixed bag for sure, and not many results to shout about. Kocjan did well at the Tour de Suisse, and Tamouridis has made the step-up admirably, getting 2 of the team’s 5 wins so far. The two Germans have been next-to-useless in terms of results, while Serebryakov soon turned out to be a terrible choice of transfer (though through no fault of the teams). Lobato has grabbed a win and looks to be quite a promising sprinter. Mestre has been decent, while Vrecer has had bad luck with illness. Chaoufi has only done as well as anyone could have thought, but no doubt he will be going back to the Africa Tour next season. If the team is still going next season, and that seems a big ‘if’ if boss Igor Gonzalez de Galdeano is to be believed (“This is the last time the Euskaltel jersey will be in the Tour de France”), then I doubt that many of these riders will still be at Euskaltel. It’s hard to really make any predictions about the future with everything still up in the air, but I would imagine Lobato will still be there. I would love to see Tamouridis at WorldTour level next year, but even if he drops back to the Continental circuit, the 32 year-old will have a great experience to look back on. I guess the same can be said for a few of these riders. The UCI’s points system is a ridiculous mess, but one small upside is that several riders performing at lower levels will be able to gain some great memories from their time at cycling’s top table.